Each holiday season keeps developing anew. This year there was much more to go along with Halloween . . . and also a little less. I have a few Halloween decorations but I didn't even put them out because I simply didn't feel like it. Thanksgiving I went for in full force with my usual flocks of turkeys and Thanksgiving day itself, while nice, slipped by so quickly in favor of a very busy Black Friday weekend. My head emerged to find that, in and out of it all, I managed to put up my tree and various other dressings. It looks festive . . . and yet it took me a moment to be able to look over and be pleased that it was festive. My eyes were at first still a little tuned out to Christmas lights and all. I also stumbled into Southwest Shakespeare's Holiday Show. Once more, I'd been certain that I wouldn't be able to go, so I'd been in the mindset that I didn't need to see it. Suddenly, though, there I was, making my way over to Taliesin West. Taliesin. Taliesin is always worth a little trip with the way that it's nestled among the saguaros a step out away from the city. The show itself was a sort of mix of music and sketches, Christmas mainly with a touch of Hanukkah. A casual and merry concoction to usher in holiday time. While I don't involve Santa in any of my Christmas decorations or traditions, I've realized that The Samta Clause is one of my favorite Christmas movies (along with Mickey's Christmas Carol). So some eggnog and the movie and some of the last of the Thanksgiving pumpkin pie one night also started to set the tone. Maybe it was the Christmas shopping that set me off, too. Usually I have most of my Christmas shopping done by November; this year I had barely started. So digging in to that and getting started on, ahem, stocking things (I have always loved the idea of candy; home videos of me on Christmas morning at two years old will verify this) started to settle me in. Not that I think Christmas is all about gifting and decorations (which is part of the reason why I like to shop early: so that by the time the season actually starts, I'm done thinking about gifts). Christmas is also about light and about new beginnings and about joy and about accepting the light and sharing the light and enjoying the light together. This year I finally bought a star for my tree. I have a Victorian-esque tree with just "candles" and pinecones and a few berries. I'd been holding out on buying a star until I found one that I really liked. This one is from Balsam Hill. It's covered in beads and the beads catch the light from the tree. Let's catch and spread the light this Christmastime. I had heard tell, through means of that called the Internet, of some exciting flavors from Theo for quite a while. 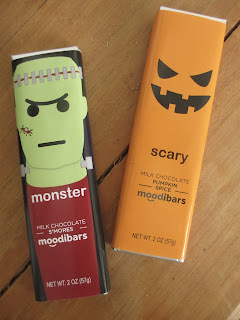 Given that I don't normally order chocolate, such flavors had to wait until finally I saw them at World Market earlier this year. We'll start off with the Cinnamon Horchata, which is a perfect flavor combination to ease us into fall. As is usual with Theo, the packaging is lovely. Flowers and cinnamon sticks and red patterns and yet it's all kept against a white background so as to stay balanced and not chaotic or overdone. Now, I didn't get much of the cinnamon flavor on the first bite until the chocolate was almost melted. It is, though, a good cinnamon taste, fresh and with the right amount of strength. You can taste it in a strong sort of way and yet not in such a way that it becomes spicy. What makes it Cinnamon Horchata, though, you ask? That would be the crisped rice. The odd thing, though, is that Theo has gone with the current trend to use both crisped rice and quinoa. I've already gone over why I don't see the point in doing that, but I also don't understand in this case because rice is what you use in horchata, not quinoa. So if the crisped rice is the only horchata element (and already an element that's kind of stretching the concept), then why take out part of it to use quinoa? Still, that's all in theory. In practice, the quinoa is indistinguishable from the rice. The crispy texture isn't exactly reminiscent of drinking horchata, though it is true that naming this chocolate Cinnamon Horchata sounds more exciting than Cinnamon with Crisped Rice. So I suppose it works. 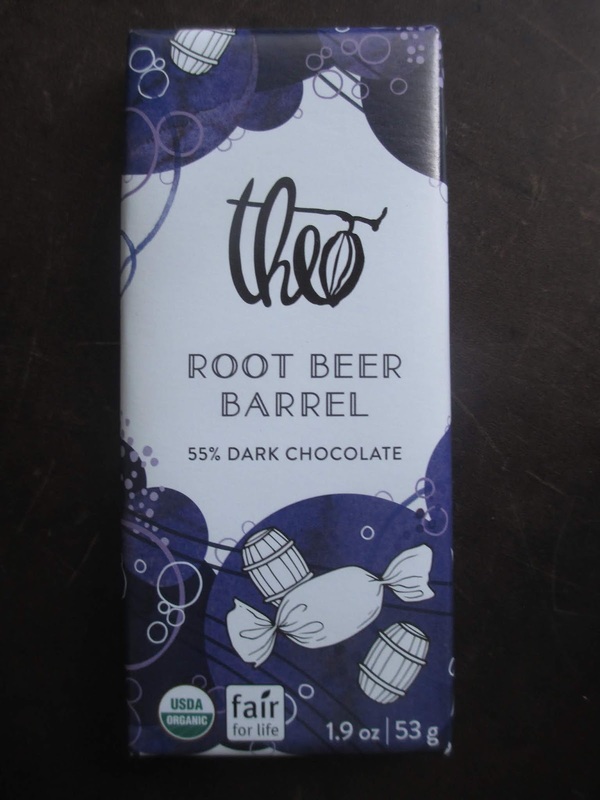 Theo makes good milk chocolate, some of my favorite milk chocolates to share with people. 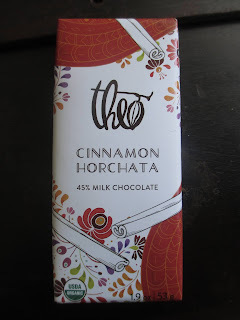 This bar contains their 45% milk chocolate, so it's a little richer, which goes well with the cinnamon. And, you know, if you like some crisped rice in chocolate to give it that casual touch, then here it is. Theo does wonderfully with chocolate like this. Chocolate that has a simple flavor (cinnamon in this case) and a touch of uniqueness (the crisped rice) and a solid, quality chocolate base. Despite being perhaps the most famous story of them all, Frankenstein is one of those books that tends to take readers by surprise. Expecting a horrific tale full of action and suspense, they instead find a book filled with pages of philosophical thought. And despite there being movie adaptation after adaptation of the story, most of them focus on the physical scene of bringing the creature to life rather than on all of the philosophical thought (not to say that they don't include it at all; they just put the focus on the action). Southwest Shakespeare Company is currently performing Quinn Mattfeld's adaptation of Frankenstein. He is part of the new artistic director team of the company. What this production, directed by Patrick Walsh, sought to present was a balance between the action and horror that modern audiences expect from this story and the philosophical elements that Mary Shelley herself wrote in her novel. They allowed the story to get a little dark and spooky at times to go for that Halloweentime feel and they also kept in passages of deep thought about life and death and creation and science and experimentation. Now, I did overhear someone commenting that the play, while extremely well-acted, was a bit choppy. I did also get the overall sense that much of the audience, if they had read the novel at all, didn't really remember much from it. So what someone else might have found as choppy, I found as their way of balancing out these two elements of the story and keeping it from being a flat, monotone, philosophical piece. I should here note that I'm not calling Shelley's novel flat or boring. Far from it; it's a wonderful work. It's just what we would today call "slow," which doesn't necessarily lend itself towards something like a movie or a play today. And that is, of course, why most of the adaptations take such a different focus. There was, certainly, more narration in this play than there tends to be in plays. Yet the way that scenes were played out kept things moving. The lighting, too, helped to create that sense of drama and weight and also to express the violence of certain scenes (like Mary's death) that couldn't necessarily be played out live. Joshua Murphy once again ruled the stage as the Creature, playing both the newly-created childlike figure and the classically-educated man. Jesse James Kamps as Dr. Frankenstein brought the obsession of a man fully bent on a project and the true horror of a man faced with a situation to which he can see no solution. That's the horror of Frankenstein, isn't it? Creation is part of life and death is part of life and creation unleashes a whole new world of possible occurrences which you cannot predict. You still have two more chances to catch Frankenstein; it's running through this Saturday at the Mesa Arts Center. The leaves are falling (in other parts of the state) and the mornings are becoming cool and the Thanksgiving turkeys are gobbling all over my apartment and all the artsy things have emerged once more. The summer season is the off season for Arizona in many ways. Now all the shows are starting up again and the outdoor festivals and all sorts of other events, like Arizona Opera's First Friday Aria Jukebox. I almost thought I might not make it to this one, but it was great that I did. I may have won some tickets to see one of their shows, so in addition to getting an hour of live entertainment for the evening they're also getting me in to a show. Thanks, friends. As I've described before, the concept of Aria Jukebox is that you get to vote on which songs you would like the performers to sing. Then you get to hear those songs in a small setting. So it's a chance to get a close-up glimpse of performance that is quite different from going to Symphony Hall and seeing an elaborate production far away on the stage. Going to the opera is wonderful but so is getting to see some of these artists in person and see what it is like to make performance your craft. There is also, of course, the human element of seeing someone in person right in front of you versus simply hearing their voice coming from a stage. It's a bit behind the scenes. Compared with last year, this event was more brief. They, for the most part, took out the Q&A, so that definitely shortened things. If you are taking part in other First Friday events, then I can see how more people would be willing to attend this one knowing that it won't take up the bulk of the evening (although I personally don't mind it going longer). I wonder, too, if they might consider having it start later. Six can be a little early for people to have a chance to make it over on a Friday night. Once more, events like this remind me how great it is to live in the city. I love pretty nature and open landscapes . . . and I love the arts. So while I am in the city, I'll take advantage of all that it has to offer. The Phoenix area has much to offer from the world of the arts. Well, well, banana chocolate certainly has turned out to be almost a new trend, hasn't it? We've gone from no banana chocolate to banana chocolate everywhere. This time it's in the Banana Nut Dark Chocolate from TCHO. And this time there are also almonds, which sounded less intriguing to me, but okay, let's go for it. You can see those almonds quite visible on both sides of the chocolate bar. 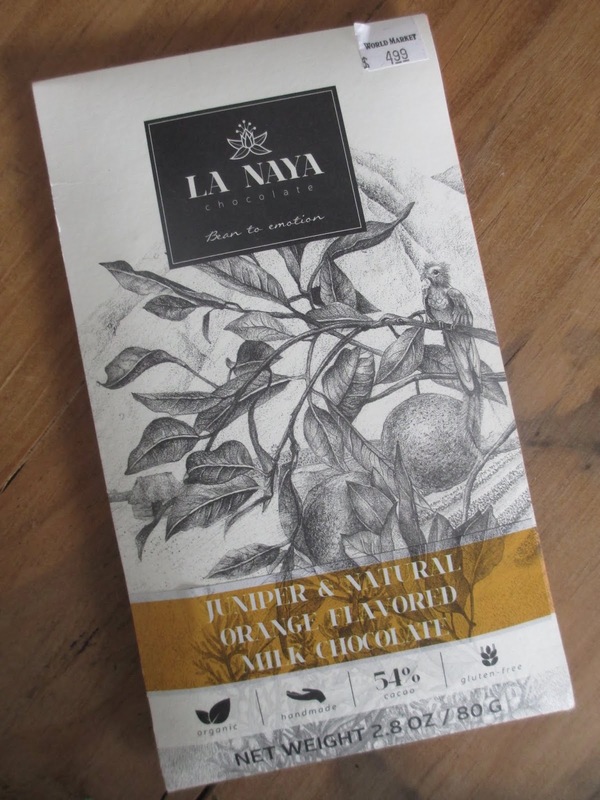 The chocolate comes in with that midway-dark aroma, which makes sense given that it has a 55% cocoa content. On the first bite, I tasted almonds, then some semisweet chocolate chip chocolate, then some salt, and then maybe some banana. The third bite had more banana. Said banana had a feeling halfway between a banana chip and a dried banana. Given that these are in fact freeze dried bananas, that feeling is about right. The gist of it is that you get more or less banana in different bites depending on how big or small those bites are and how much banana you're getting in each bite. TCHO definitely did, though, capture the banana taste. Possibly the banana effect is stronger here than in many of the banana chocolates I've been trying. Maybe the banana pieces are bigger? That's hard to tell, though, given that there always seems to be a second texture element, the almonds in this case. I'll get back to those in a second, though. First let me give a word on the chocolate. I suppose this is dark chocolate instead of milk to give more of an idea of quality but it's that semisweet chocolate chip chocolate, which is nice in its way but makes me feel caught in between two things. I wouldn't have minded just going with milk chocolate. The almonds I'm not sure about. Whether or not they were necessary is, I suppose, an opinion. I imagine that they add to the concept more than to anything else: almonds sound hip and healthy these days. Though it's also true that if you look at a different side of things, the almonds can instead bring you around to the dessert side. Chocolate chips and bananas and nuts are maybe almond chocolate chip cookies with banana slices and ice cream? Yeah, this chocolate is a decent concept of such a dessert. And TCHO often goes for dessert type flavor combinations, so it fits. In the end, I'd say it works. Around Halloween, the Desert Botanical Garden has their Strange Garden event a couple of nights. Now, if you're like me and you don't have kids that you'd want to take specifically to the event and you have membership so you usually try to avoid high traffic times, you can still get a taste of Strange Garden by going during the day around the time of the event (or even in the evening on a night near the event night). You will still get to see the wonderful pumpkin scenes this way. I went during possibly the worst lighting time of the day, especially since I wasn't expecting to bump into the scenes right away in the Wildflower Trail (last year they were set up in another part of the garden that I walk through more on my way out instead of first thing). First I found this delightful family playing with their child. Then these pumpkins were doing some work in the field. These were swinging from the palo verde branches. And some more goofing off, skateboarding and biking and such. This one was just sitting and enjoying the peace of the garden. These two were on a hilltop enjoying the peace of each other's company beneath the teddy bear cholla. And behind some other cholla, I caught glimpses of a campsite. Then there was this one jumping rope in the bushes. And these I think shoeing their horse (it's kind of hard to tell from the picture and I didn't stay to look at this one too long in person because there were other people nearby taking their time checking it out so I didn't want to get in their way). Even some mariachis playing tunes to the plants. This girl with her ponytails was just wandering around waving her ribbon wand. And the hula dancers were hula dancing. And the diver was diving into a little pool beneath. Not part of Strange Garden, yet still fitting with the theme, the Giant Starfish are in bloom right now. Yes, that flower is from the green sticks behind it (and you can even see some of the unopened, still forming flowers on the right side). They're one of my favorite flowers at the garden because of how amazing it is when they finally appear (most of the year you won't see the flowers, so they're a special treat to see). And then there were some eyes here and there on the prickly pear. And on this guy, too. And again, not part of the extra theming, but I was excited to see these cactus in bloom, too. They're also one of my favorites (I mean, look at the great shapes they make on the ground) and I usually only see them in bloom in spring. We've just been getting so much rain lately that all the plants are rejoicing. And here are some pretty green sticks growing around a palo verde. Lovely, aren't they? One more Starfish to finish it off. You can't tell from the picture, but this one was huge, much larger than the others that I usually see. If you're familiar with the garden, this one was over by the Patio Cafe; maybe because I walk there less often, I hadn't even realized that this plant was over there, too. (Well, they do also move some plants around, so it's possible that it hasn't always been there, but it looks pretty settled to me, don't you think?) And it's so far from its plant that it's even more amazing to think of from where it's growing. 'Tis a strange and lovely garden, indeed. One half of the story takes place in the "present," which is during the time between Episodes III and IV. The other half takes place in the past, which is the Clone Wars era. There are interesting aspects to the present storyline: you get to see dynamics between Vader and Thrawn and all of that. Mainly, though, it was the past that lured me in. I love to see that time. I like to see Padme at her best, as the double figure of ambassador and heroine. And I like to see Padme and Anakin's relationship, specifically the ways in which they lived that double life. They're steadfastly connected and they do work together publicly but they're also trying to pretend that they're just casual acquaintances. And then there is also the Vader/Anakin connection. That's where the present storyline was great to watch, as well: you saw the shadow of Anakin over Vader. There is this sense of the past that he suppresses and tries to pretend doesn't exist--but it's still there. Hmm. Obi-Wan said that Vader killed Anakin and that when Vader came into being Anakin died. But did he? Can you truly kill a good person? A good person can let destruction reign, yes. But does goodness die so easily? So, anyways, while I didn't overly care about what the plot was or wasn't (it had an element of mystery/curiosity to it, but I was never curious to discover what was going on), I did enjoy what this book offered as far as characterization, which is of course what I'm after from Star Wars in the end, anyways. 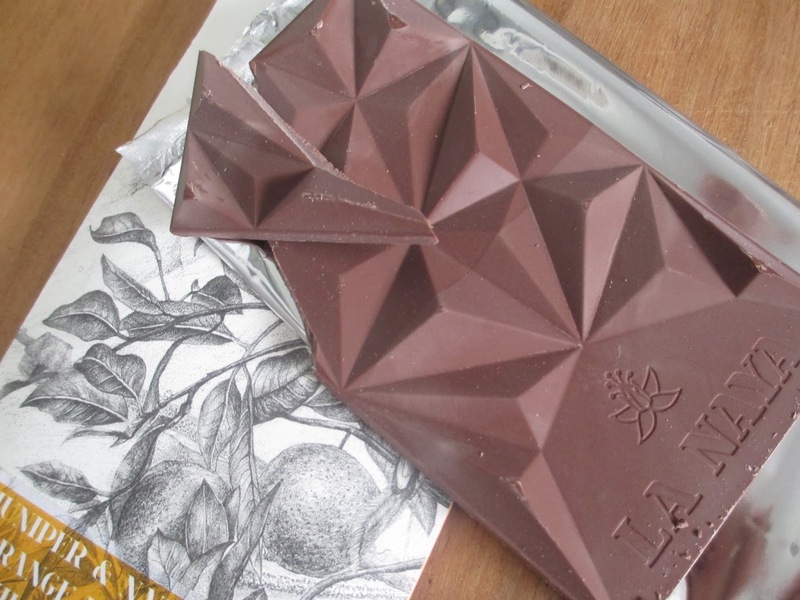 After telling everyone of the prettiness of Black Butterfly's new Snack Bars this summer without showing any pictures, now I've at last had one of these chocolates smuggled over to me, intact and unmelted, from Prescott. And this time it's probably a flavor more after my tastes, the classic Fleur de Sel Caramel. Now you can see the pretty (even with my lack of photography skills). You see how it's basically a combination of a chocolate bar and a truffle? An approachable twist and a sure temptation. In this bar, the little bubbles are what contain the caramel. While some salted caramels are subtly salty, this one isn't. This one is salty enough that salt is probably the strongest flavor element of all. 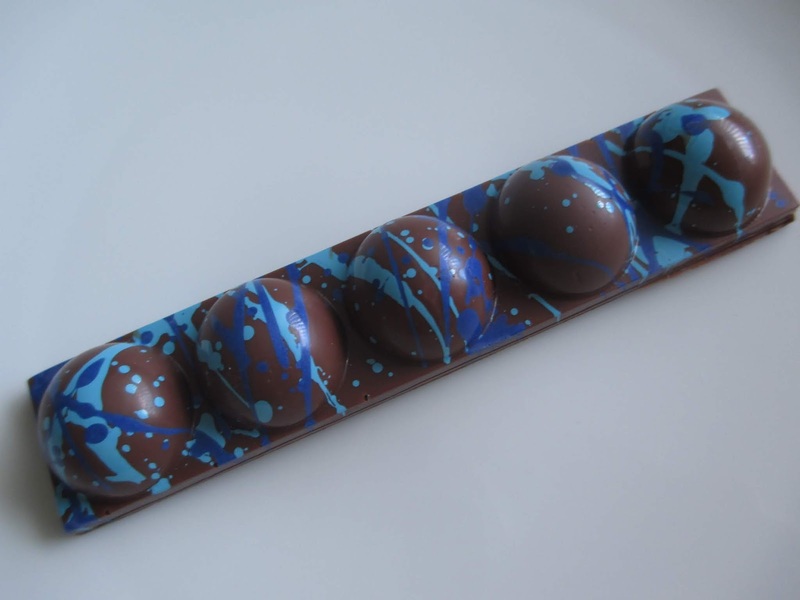 I like best to just bite a whole bubble off, so that you burst through the chocolate base and the chocolate shell into this flowy, salty, and sweet caramel. The Snack Bar concept kind of allows shall we say a more reckless approach. I never put a whole truffle in my mouth--yet I don't feel bad to eat one of these bubbles in one bite. And doing so is what allows that complete texture experience. Besides the salt, the caramel of course also comes in with its pleasant vanilla flavor. 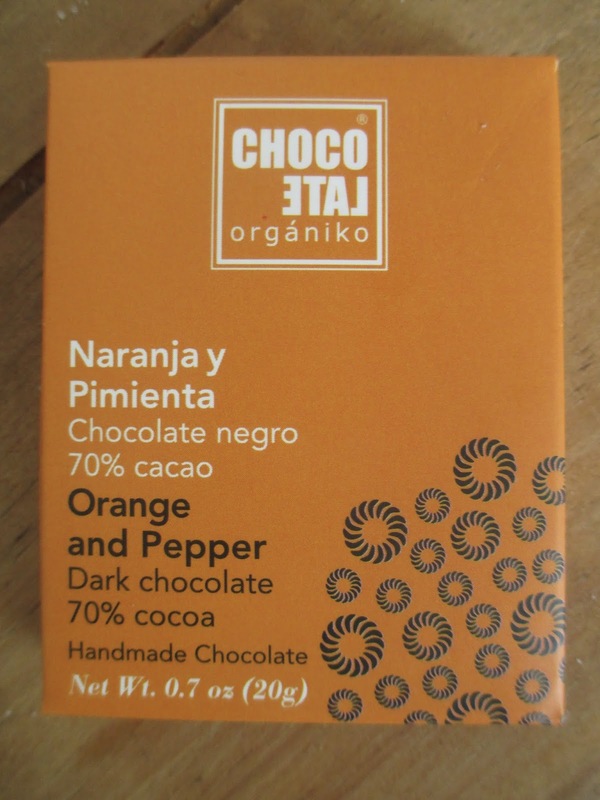 While sometimes Black Butterfly's milk chocolate (which comes in at 41% cocoa) tastes sweet to me, here I do taste more of that richness of the higher (for milk chocolate) percentage). 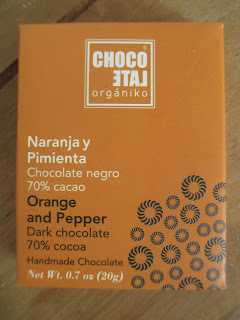 The chocolate also amplifies the vanilla flavors. Possibly the caramel might be a tad too salty for me, yet I've still much enjoyed this chocolate. When you have a flavor that's more to your tastes and you have such a setting as this, it's very easy to just eat the whole bar in one go. Which, as I keep mentioning, is kind of the idea of these Snack Bars. Wholeheartedly approachable and tempting. The later part of September was a tad warmer than usual this year. Normally by that point the edge of the heat has come off, but this time we had an earlier cooler spell (as in, less hot spell) followed by one last hot spell before the switch to October brought the sudden onset of Fall. The nights cool off enough now that it takes a little bit of time for the day to heat enough to actually be hot instead of just comfortable and pleasant. In fact, the nights are suddenly cool enough that I just switched to my winter sheets. The air tastes different. The baked scent of summer is gone, turned crisp instead. The colors around the Phoenix area don't change much until January, but if you drive even just a little north, you'll find the greens beginning to fade and the leaves beginning to disappear. The light has changed. It's now dark in the morning when I get up. And the sun is already flirting with the horizon by the time I'm heading home--the nice part about that is that I get to see all the brilliant pink colors while I drive. These changes have been happening over the last few days, but it was this morning that I felt wrapped up by Fall. I felt cozy and comfortable and happy. I made a second cup of tea. In the morning, I put on my cashmere house sweater (that means that it's mended and not for wearing out but still ridiculously comfy for home use), and by late morning, I had all the windows open to finally let the place air out after the long summer. I felt wrapped up by all that Fall beckoned. A touch of Halloween perhaps, but mainly the promise of Thanksgiving and Christmas. 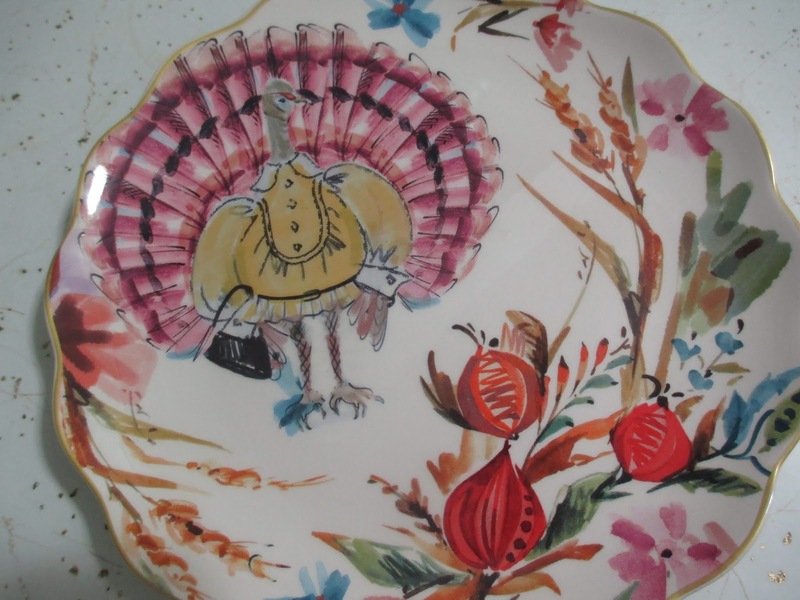 Turkeys and tablecloths and cookies and pies and family. The holiday season is a good time, a time when we're constantly thinking of ways to bring cheer to the short and dark and (sometimes) cold days. Thanks be for the beauty of the changing seasons. 'Tis that time again, the time in which I wander around to the theatre and the ballet and the opera. The first of the season was also part of Arizona Opera's new McDougall RED series. With these, they're going for shows with a slightly different tone or style and putting them in the smaller Herberger Theatre rather than the grand Symphony Hall. Even that change means quite a big. While Symphony Hall is so big that you can buy last minute tickets for the opera no problem, Herberger is small enough that seats were getting filled up much sooner. As per usual, I took the very back balcony row, even though this was my first time at Herberger and I wasn't sure how a seat in that row would be. Turns out, though, that this seat was perfectly great. Though the balcony is greatly tiered, it wasn't to the point that you felt like you were going to fall over (like at a big arena), simply that it was tiered so that you could be closer to the stage and with a clearer view than if there were little or no tiering. The small size of the theatre was more comparable to watching a play at the Mesa Arts Center than to watching an elaborate opera or ballet at Symphony Hall. 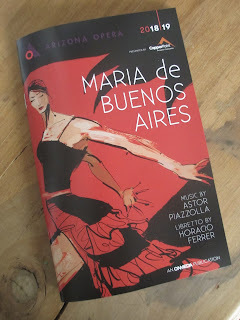 Indeed, the show itself, Maria de Buenos Aires, was almost more like watching a play than an opera. Celeste Lanuza as El Duende made me think of something like spoken word in the way that she wasn't quite singing but not quite just speaking, either. And while opera tends to be about big shapes and movements that you can see far away (with the main emphasis on sound rather than sight), this show made a little more of movement. It's a tango opera, so of course there was dancing, but also other types of movement that went along to help tell the story. And the story? A story of sorrow, the story of a woman who is born from the toying meddling of El Duende to a life of pain. Yet also the story of a woman who feels deeply and, led by a song in her soul, pictures great things. Is it a story of triumph over darkness? No, not really. Triumph hardly seems to describe what the ending felt like: it felt more like taking a breath after struggling to hold it beneath water for a very long time. I don't know. I think this opera was more about the feeling of each moment than a particular theme. As you'd expect from a tango opera, it is often deeply moving and sensual and striking and bold and did I mention moving? The audience knew going in to expect something different. You could get the vibe in the first few scenes that everyone was kind of trying to get their bearings and figure out what type of a show this was, but by the time Maria (portrayed by Catalina Cuervo) sang "Yo Soy Maria," we were all enthralled in this weird web of red darkness. I don't have the words to describe Catalina Cuervo singing as Maria. She has been in this role over 50 times, and so it would seem that she has entirely embodied the passion and sorrow of this character. She took hold of the whole audience. And when Luis Alejandro Orozco joined her as the Payador, it was . . . like this beautiful passion of love that they were singing. While an opera is usually close to three hours, this was only an hour and a half (which is kind of nice for a modern audience because you can just focus in on enjoying rather than getting either antsy or sleepy before the end). Yet it felt like it covered so much that it couldn't have been so short as that. Fascinating and striking. That is what Maria de Buenos Aires was.